The Guide to Oregon Fly Fishing in Southern Oregon. The Rogue River and Umpqua River are famous for their Steelhead Fly Fishing. 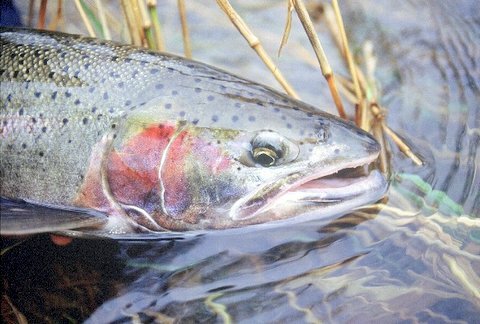 Over 300,000 Summer Steelhead enter the Rogue River alone. The Klamath Basin abounds with Trophy Rainbow Trout Fly fishing. Rogue Country is the Oregon Fly Fishing destination for very rich Summer Steelhead Fly Fishing opportunities. The home to more Summer Steelhead fly fishing than anywhere else on earth. Famous Summer Steelhead fly fishing rivers located here are the North Umpqua east of Roseburg Oregon, the Rogue from Gold Beach Oregon to above Shady Cove Oregon has 160 miles of top Summer Steelhead fly fishing waters, the Klamath in Northern California has 150 miles of historic Summer Steelhead fly fishing. This adds up to nearly 350 miles of top fly fishing rivers to flyfish in Rogue River Country. Summer Steelhead come in a variety of sizes as may go to the Ocean to rear for as little as 3 months or as long as 3 years, add to this multiple spawning runs, as Summer Steelhead return to the sea after spawning. The Rogue River and Klamath River have “Half-Pounders”. The name “Half-Pounder” means little in describing the size of these dynamic Steelhead which run 1 to 3 pounds and are readily caught by fly fishing methods. Extremely active and aggressive, these silver rockets are a treat to catch on light tackle and fly rods. Making great sport Flyfishing with light line. It is said that the North Umpqua is a fly fishing graduate school. The North Umpqua is a tough place to get good grades. The North Umpqua has the most beautiful scenery and Fly Fishing waters fishing in the nation. Steeped in fly fishing history, home to Zane Grey, if only the pools and riffles could talk. The North Umpqua Highway follows the stream up into the Cascades from Roseburg to Glide, then on to Steamboat, the heart of the North Umpqua Fly Fishing waters. Across the river on the south side the old Cornel Mott trail will give access for Flyfishing the south side of the river for about 5 miles. A good place to start a Oregon Flyfishing trip on the North Umpqua is with one of our member Oregon Flyfishing Guides with local Oregon fly fishing knowledge. Fly fishing opportunities on the Lower Rogue River is predominately Summer Steelhead “Half-Pounders” 12 to 18 inches with a few 20 to 26 inch adults. Most Summer Steelhead Flyfishing is done here while fly fishing between Lobster Creek and Agness Oregon, which is about 22 miles of water, all on Siskiyou National Forest. Guided Oregon Flyfishing clients will hook 10 to 30 “Half-Pounders” on most days. We have several Rogue River Flyfishing Lodges to make your Flyfishing trip comfortable. 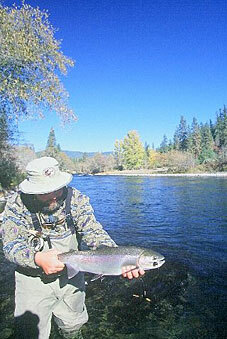 One of our local Oregon Fly Fishing Guides can assist you with your Oregon fly fishing trip planning. A Rogue River Canyon Summer Steelhead Drift Boat Flyfishing trip is 3 to 4 days of drifting and Flyfishing through the Federally Designated National Wild and Scenic Wilderness section, 47 miles of fabulous scenery and whitewater. This is a tremendous Oregon Fly fishing excursion that will always stay with you in fond Flyfishing memories. Choose to camp at rivers edge or stay in the Rogue River Canyon’s Historic Wilderness Lodges such as Half Moon Bar Lodge or Black Bar Lodge. 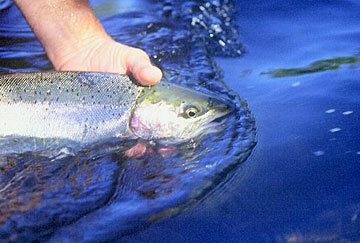 Contact one of our Oregon Fly Fishing Guides for Oregon fly fishing dates and information. Most Summer Steelhead here are returning adults running 4 to 10 pounds. This area is best accessed and the best Fly fishing is from a Drift Boat with with stops to get out a wade. Very large numbers of Fall King Salmon or Chinook spawn in the middle Rogue River area, Summer Steelhead will hold up around these spawning areas to pick up salmon eggs and dislodged water insects. Giving a great Oregon Fly Fishing opportunity. 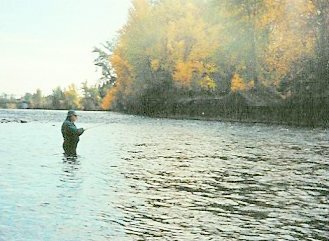 The best time to be Flyfishing the Middle Rogue River is October 6th to November 15th. Contact one of our Oregon Flyfishing Guides for fly fishing dates and information. On the Upper Rogue River area above the old Gold Ray Dam site is fly fishing only in Sept. and Oct. Most years ten thousand to twenty thousand Summer Steelhead return to this area. This stretch covers about 25 miles of top level water for Summer Steelhead Fly Fishing. With annual Summer Steelhead runs to the Upper Rogue River exceeding 10 thousand fish, Summer Steelhead densities of 400 fish or more per mile are very likely. 50% of these Summer Steelhead above the old Gold Rey Dam site and are fin marked hatchery origin steelhead on their way back to Cole Rivers Hatchery. Nearly all Summer Steelhead in the Upper Rogue are adult fish. The Upper Rogue River has great bank access to Fly fishing waters holding adult Summer Steelhead, with wading and Fly fishing being the best method. Drift Boats are used to access more secluded and deeper Fly fishing runs. 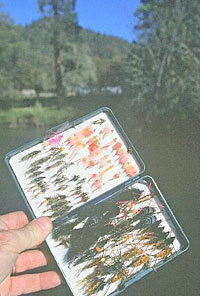 Contact one of our Oregon Fly Fishing Guides for your best Oregon Fly Fishing results. Historically the Klamath River is one of the most famous rivers for Summer Steelhead fly fishing. 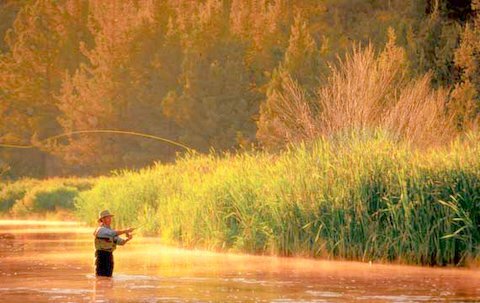 Many of the most famous fly fishing masters learned from these waters and fish of the Klamath River. Ted Fay, “Polly” Rosborough, Mike Kennedy, Zane Grey were a few master fly fishing pioneers to cast a fly for a Summer Steelhead on the the Klamath River in the early days of Steelhead fly fishing. You still feel them there, wading pools and laying out casts on the Klamath, Umpqua and Rogue River.